Innovation in Conveyance - ComTrac is designed to convey electric, electro-mechanical and mechanical services all within the same rig-up, saving both cost and time. ComTrac® is an innovative intervention system designed to convey electrical, electro-mechanical, and mechanical services within the same rig-up. It offers a cost-efficient alternative to a broad selection of conveyance challenges, along with the ability to access wells not currently feasible with conventional conveyance methods. Carbon composite materials have enabled significant advances in the aerospace, automotive and manufacturing industries due to their unique properties. Archer, together with C6 Technologies, has brought these advances into the well intervention arena with the development of a semi-rigid composite rod encapsulating an electrical conductor. Carbon composite construction brings high strength and low weight compared to conventional cables with the added advantage of being able to enter wellbores not accessible with gravity alone. A heavy duty electrical conductor allows both logging services and high power electro-mechanical tools to be run. Designed from the outset with ease of operation in mind, ComTrac® offers flexible rig-up to enable operations even in areas where space is at a premium. 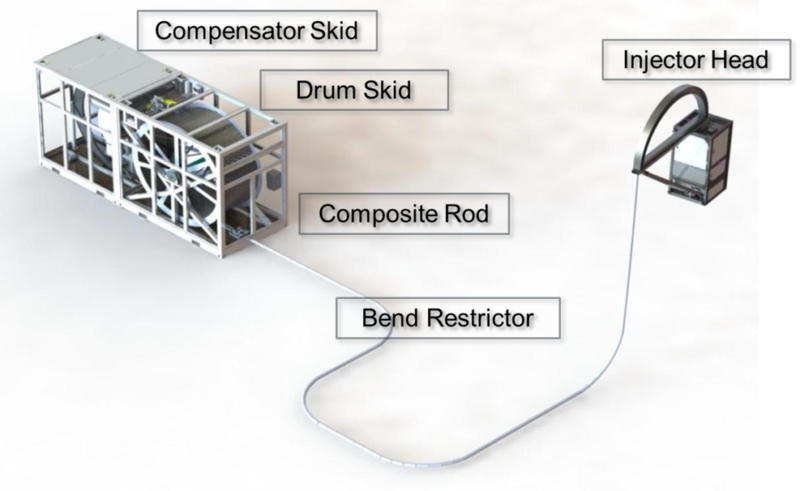 Direct line of sight between unit and well is no longer required, and the unique Bend restrictor technology allows fully flexible routing to the injector head while enclosing and protecting the rod.